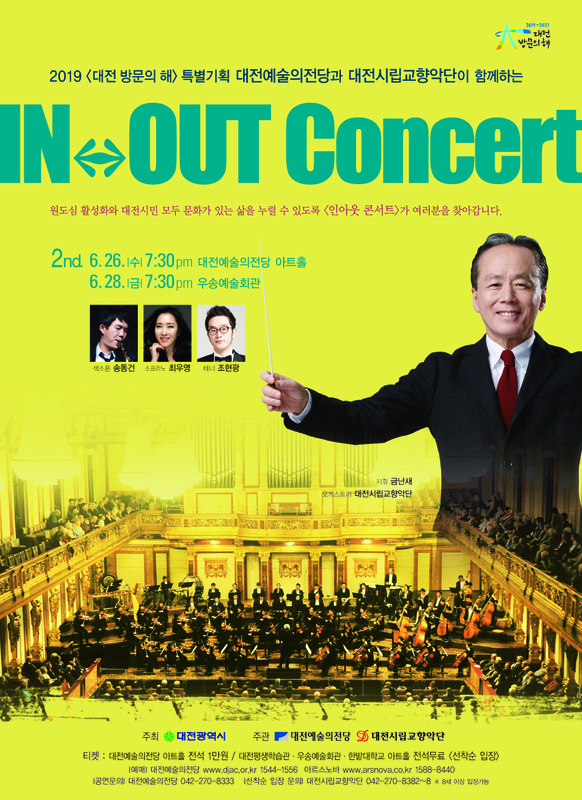 [Program] 베토벤 교향곡 제5번 c단조 "운명" 중 1악장 Beethoven Symphony No.5 in c minor Op.67 "Schicksal" 1st mov. 푸치니 오페라 중 ‘오 사랑하는 나의 아버지'(소프라노 최우영) Puccini ‘O babbino mio caro' from the Opera 구노 오페라 중 ‘줄리엣의 왈츠' (소프라노 최우영) Gounod ‘Je veux vivre' from the Opera 하이든 교향곡 제94번 중 2악장 Haydn Symphony No.94 in G Major 2nd mov. 이투랄데 색소폰과 오케스트라를 위한 '페퀘나 차르다' (색소폰 송동건) Iturralde 'Pequeña Czarda' for Saxophone and Orchestra 멘델스존 교향곡 제4번 A장조 "이탈리안”중 3악장 Mendelssohn Symphony No.4 in A Major, "Italian”, 3rd mov. 베르디 오페라 중 ‘여자의 마음' (테너 조현광) Verdi ‘La donna e mobile' from Opera 푸치니 오페라 중 ‘공주는 잠 못 이루고’(테너 조현광) Puccini ‘Nessun dorma’ form Opera 차이코프스키 교향곡 제4번 f 단조 Op.36 중 4악장 Tchaikovsky Symphony No.4 in f minor Op. 36, 4th mov.